At the end of the last post, I had set off for the western continent to find the Heavenly Shield. A few things I forgot to mention: Papas says in his letter that Kurisu's mother is still alive but captured by demons. Also, the "hero equipment" that is the Heavenly Sword, Heavenly Shield, etc. 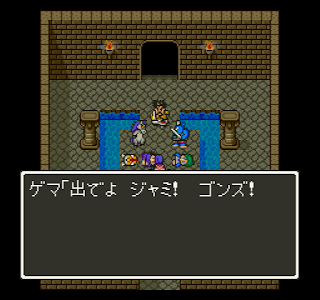 was translation in Dragon Warrior IV as "Zenethian" equipment. 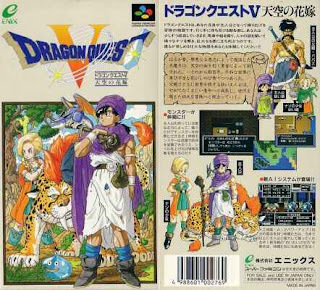 DQ 4-6 form a loose trilogy with some connected themes; it's not like 1-3 where the stories actually connect, though. After finding Bolongo the panther we set off for the Salabona, a large city on the continent. 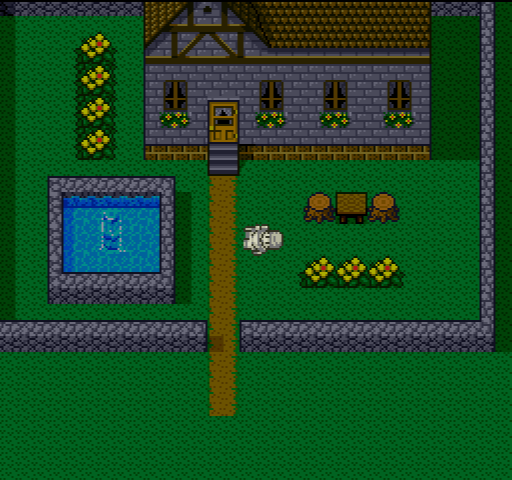 After a quick detour to learn the Rula spell (that lets us teleport to towns we've visited), we reach Salabona to find that the richest man in town is giving his daughter Flora to whoever can find the Fire and Water rings. There's a good chance that this man has the Heavenly Shield, so it's time to get a bride. The fire cave is a really hard dungeon. 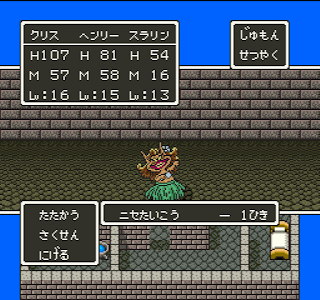 It's long, has a lot of damage floors that you have to go through, and the monsters are fairly difficult too. At this point you only have Kurisu plus two monsters -- I was using Pierre the Slime Knight because he has heal spells (I'm actually still using him), and Bolongo. 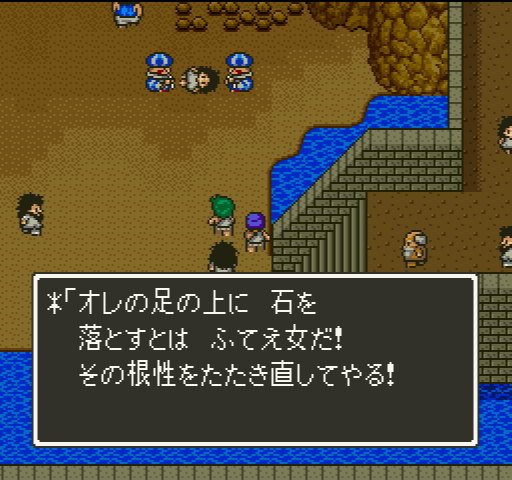 Fortunately you get your wagon in the cave so you can have backup units in case they die. 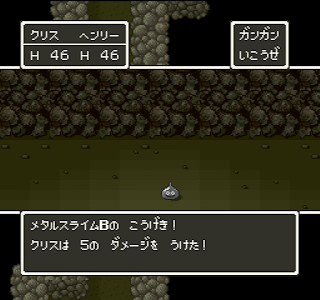 The worst enemies in this dungeon are the bombs, who use Megante. This spell kills the caster but then has a chance to kill all the opponents. It's not a spell you want to cast, but it can be devastating when the enemies use it. I never got a game over from them but I had 2 out of my 3 guys die. Then we have the bosses. They can breathe fire for fairly high damage, which is rough if they all use it. If you can beat one of them and still have a decently healthy party it's smooth sailing from there, but it's easy to die before that can happen. 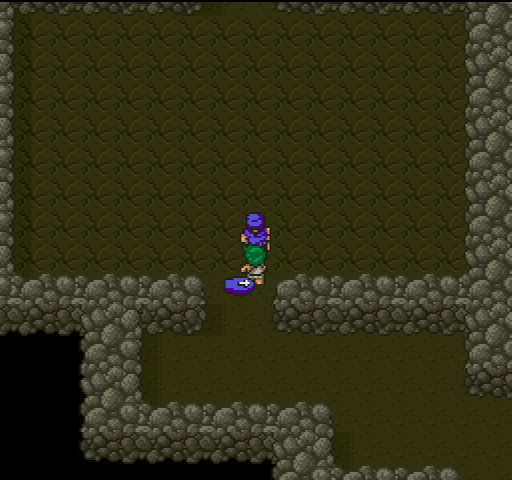 It took a lot of trips in the cave, several game overs, and even a period where I explored around to see if there was anything else I can do other than this dungeon. Eventually I won, though, and got the fire ring. 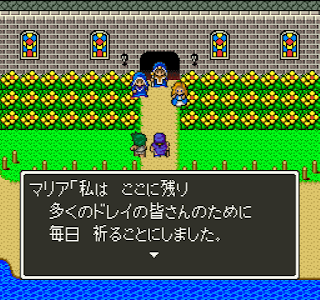 Next Flora's father gives you his ship to find the water ring. 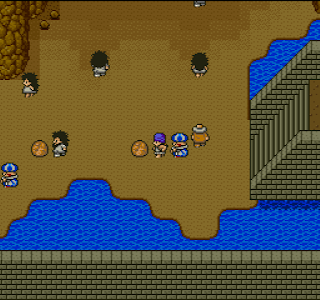 A bridge blocks your way so you can only explore a lake on this continent. 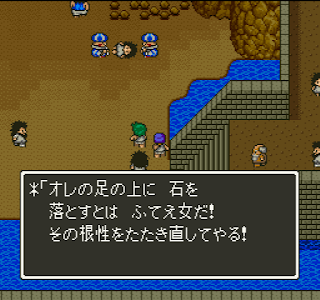 In order to reach the cave with the water ring, we first need the people of a small hot springs village to lower the gate. In that village, who do we find? Bianca, your childhood friend, has been here for a while. 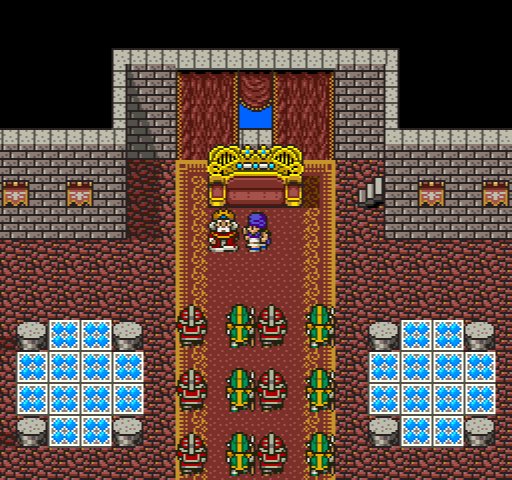 She decides to come with you on your quest to marry Flora...awkward. Unfortunately Bianca has the same level and equipment as when you left her as a child -- what was she doing all this time? There's also a rumor here about a temple being built to usher in the Kingdom of Light, presumably the one slave Kurisu was working on. 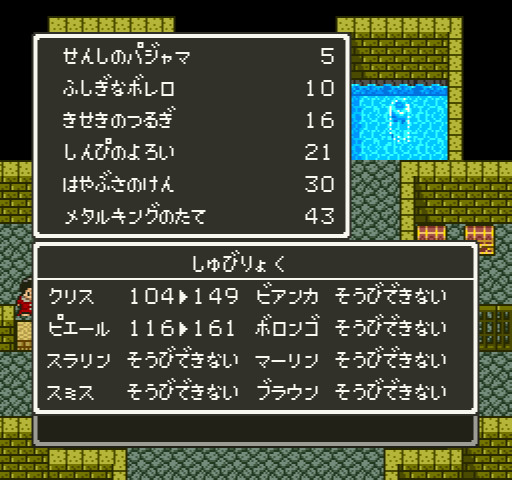 Fortunately the water cave is much easier than the fire cave and has no boss, so it's easy to recover the ring and head back. But now we have a choice -- who to marry? I barely know anything about Flora at this point, so I went for Bianca. 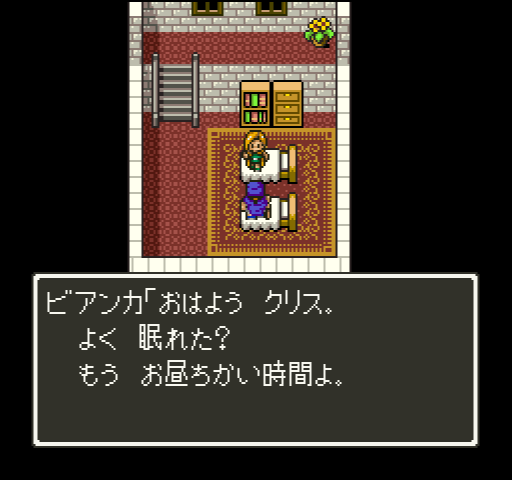 I guess the dilemma is supposed to be that if you marry Flora you'll get the Heavenly Shield? But of course the game's not going to leave you without a way to get the shield. This is all very sudden, but next thing you know, it's wedding time. 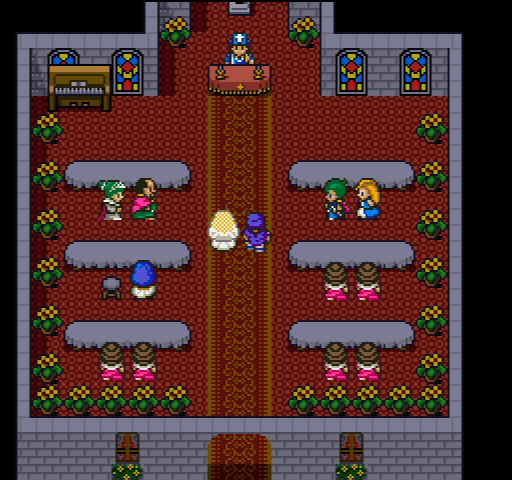 The DQ tradition of choices at silly places continues, as you can pick "no" when the priest asks if you accept Bianca as your wife. After the wedding, you have your first night together...in separate beds. We'll have none of that hanky panky in my house! 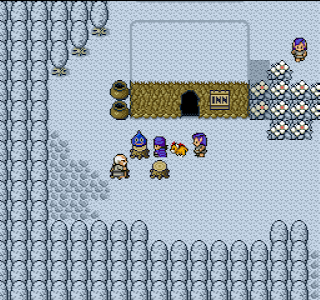 But the adventure isn't over yet -- it's time to set out again to find the remaining pieces of Heavenly equipment. 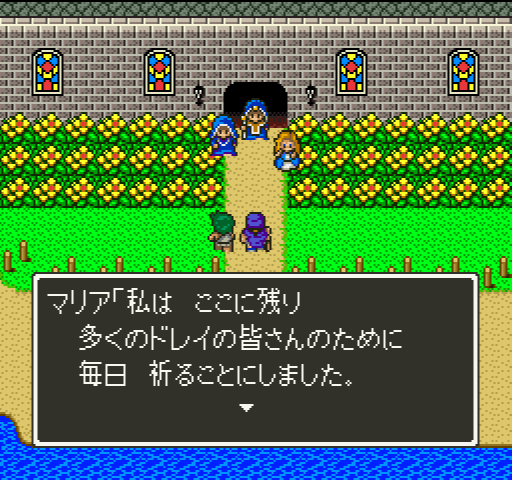 Flora's father gives us his ship and we hear about a castle in the desert to the south where the grave of the Hero is. 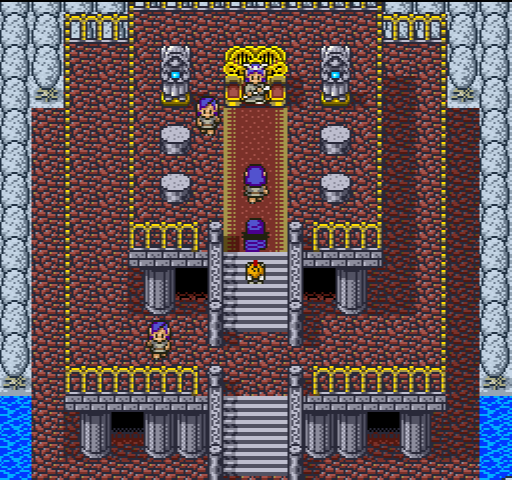 Along the way, I finally make it to the Medal King's castle. 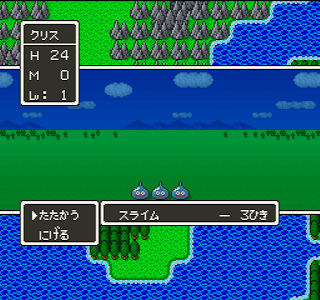 Dragon Quest IV introduced items called "small medals" hidden around the world which you could then turn in for prizes. 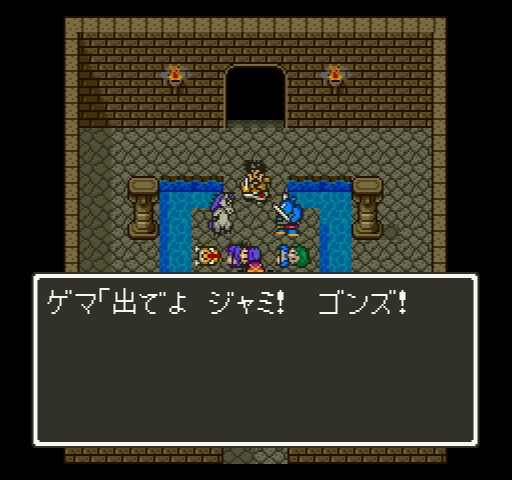 DQV continues this tradition; we're still trading them in rather than just getting rewards for reaching a certain number of medals. Of course I'm tempted to save up the 43 for the Metal King Shield; as of this post I'm at 26. Moving on to the desert castle, they are keeping the Heavenly Helmet, but unfortunately it doesn't fit Kurisu so we move on. 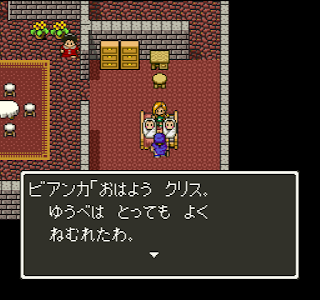 But this detour isn't entirely useless -- we hear a rumor that King Papas left his kingdom in the East with his child. So daddy was a king? Well, obviously the next destination is his kingdom, where I guess Kurisu is now the true king given Papas' death. 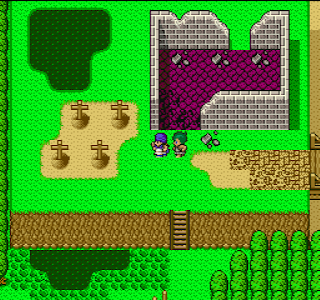 Getting to Granvania Kingdom requires landing to the south of it and progressing through a huge dungeon that's divided into two parts. You climb to the top of a mountain and reach a small village, where you can see your goal in the distance. 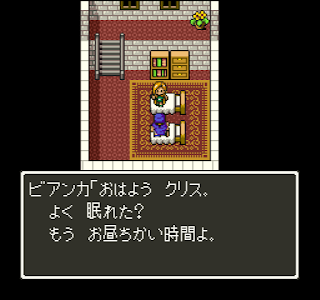 Bianca collapses from exhaustion, but after one night in the inn she's OK.
One side note: as you can see in the image above, only Kurisu and Bianca are there. 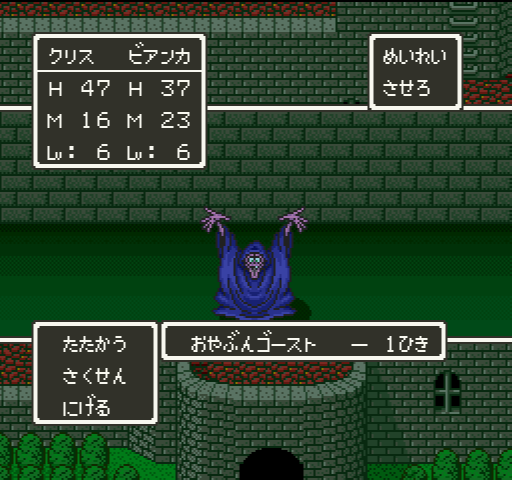 The game often forcibly removes monsters from your party during story sequences, and if you forget to add them back in, you suddenly find yourself solo vs. the monsters. Fortunately you can sub them in during battle, though, unless you're already in a dungeon. 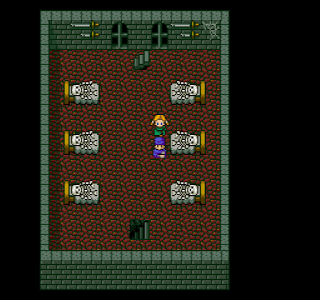 The second half of the dungeon is confusing, with lots of pits, mimic chests (which do give small medals), staircases, etc. It took me several tries to get through it. 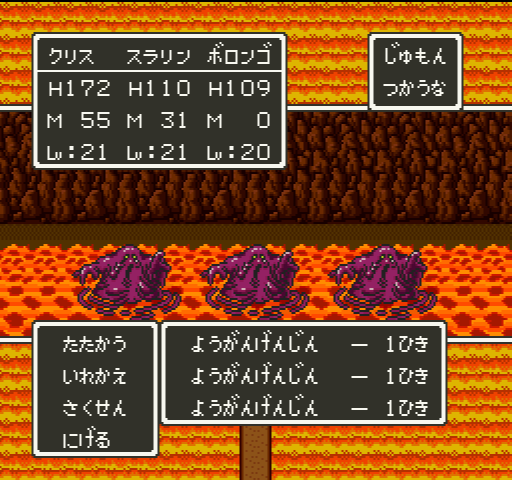 There were "hagure metal" ("Metal Babbles" in the NES games) but I didn't manage to kill any of them. 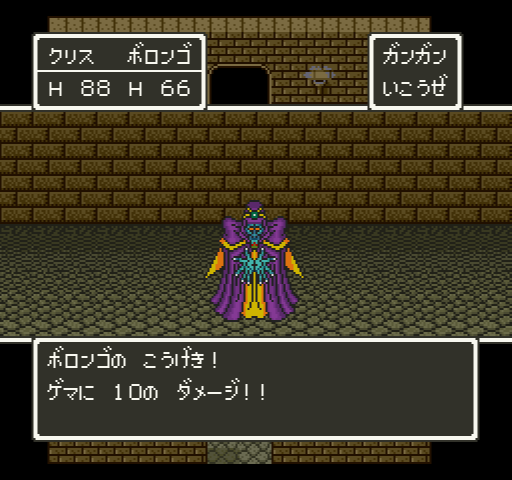 Finally we reach Granvania. Nobody believes that you're the king, of course, but in a small house to the side lives Sancho, who was a close friend of Papas and recognizes you. He brings you in to see the king, who is the brother of Papas. Unfortunately Bianca collapses again, but for a good reason: she's pregnant! 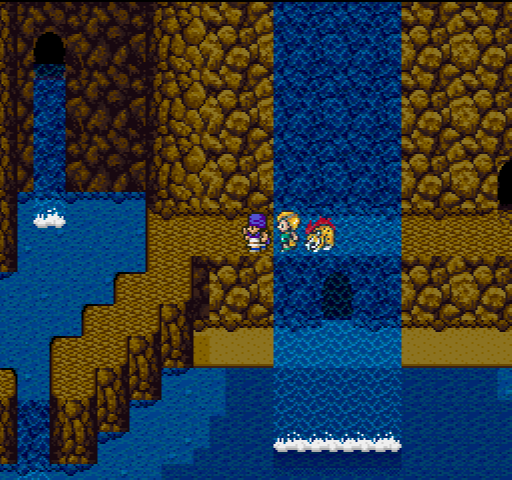 Now to become king, you have to go through a cave of trials and recover an item of proof. The current king doesn't seem too concerned by that but the Minister insists...very suspicious. The cave itself has a number of puzzles and confusing places, but it's not very long. We recover the proof only to be attacked by people sent by the Minister, who want to keep the current king. 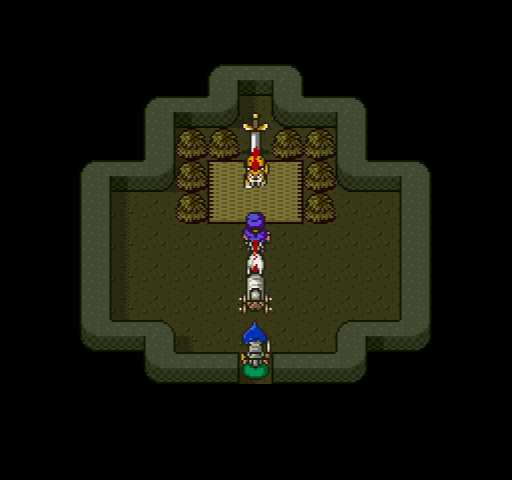 After an easy fight, it's back to the castle. The timeline is a little confusing but it's time for Bianca to give birth. Players may remember at this point that this is the same room Kurisu was born in at the beginning of the game, just before Martha (his mother) got taken away by demons. Fortunately Bianca survives the pregnancy. I named the twins Leto and Ghanima, and I expect big things out of them. Next up is the coronation. And thus ends Dragon Quest V! No, of course not. 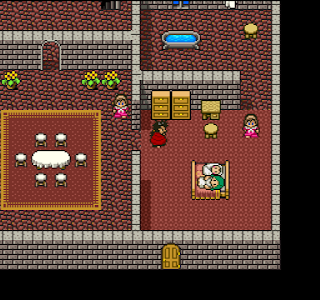 After a night of drunken revelry, you make your way through a silent, BGM-less castle to find that Bianca and the children are gone. Fortunately the maid hid the children under the bed, but Bianca has been captured. The Minister is also gone. But entering his room we find some Flying Shoes, which take us to a new area to the north. A man tells us that monsters were taking a woman to a tower in the north. 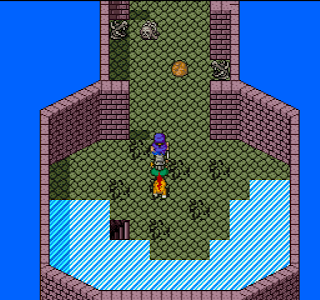 The tower is another complex dungeon with a lot of tricks and traps, such as the following, where you have to put boulders in front of dragon heads to avoid being burned by their fire. Finally at the top we reach Jami, who was one of the monsters that killed Papas. He's holding Bianca captive. Other DQs I have played had very severe difficulty spikes at significant bosses (I remember 6 and 7 being particularly bad in this regard), but fortunately Jami's not that hard. At first he's nearly invincible, but Bianca somehow makes light come out and take down Jami's barrier, allowing us to defeat him. It seems that Bianca is a descendant of a past heavenly hero. But Jami has his revenge, turning both Bianca and Kurisu to stone before he dies. 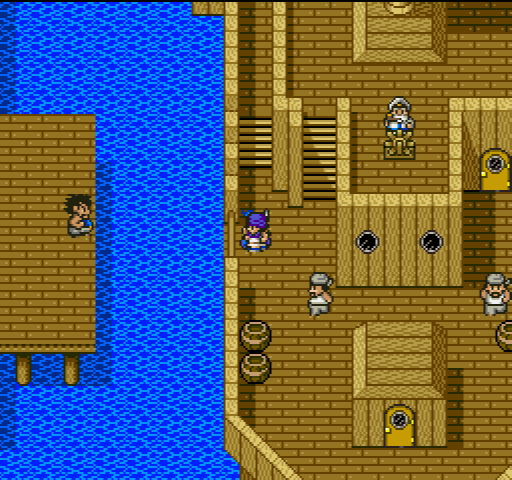 The next sequence is very well done and one of the best things I've seen in an RPG of this era. 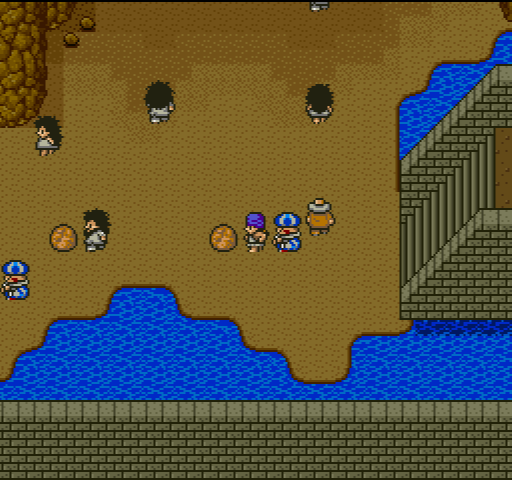 As we were going through the tower, we met some people who were looking to loot treasures from it. They make it to the top and decide to take the statues of Bianca and Kurisu and auction them off. Do I hear 1000? 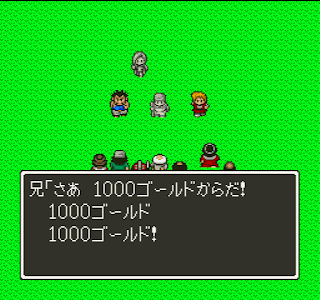 1000! Kurisu is sold to some rich guy, but the thieves decide to keep Bianca's statue for unknown purposes. 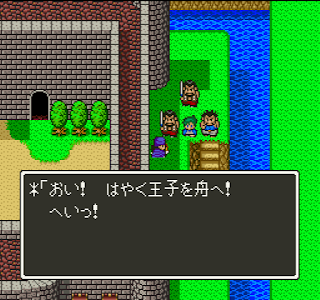 Meanwhile back in Granvania, Papas' brother has to become king again because Kurisu has disappeared. The rich guy brings Kurisu back to his house to serve as a decoration and guardian of their house. Now you see several scenes where his child George grows into a young man, but then is captured for slavery by monsters. This pisses off the rich man so much he knocks the statue over. And thus the seasons pass, with Kurisu lying in the front yard. Finally 8 years have passed, and Sancho has brought Leto and Ghanima to the house. Who knows how they found it, but they are able to restore Kurisu to life. Unfortunately Bianca's whereabouts are unknown. However, Leto can now equip the Heavenly Sword and Shield, so it seems we've found our hero. This is a good place to stop for this post. This is definitely the most fun I've had with a game so far on this blog. 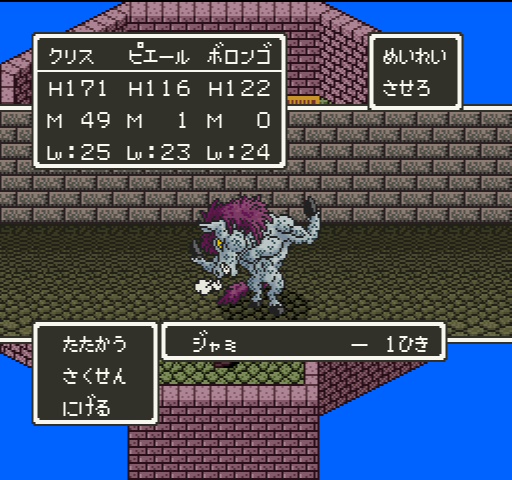 I still haven't felt the need to use a speedup hotkey despite the rather high random encounter rate -- at least the battles move quickly. At the end of the last post, I had gotten to the end of the childhood section of the game. Papas is killed, and Kurisu sold into slavery, then the game advances 10 years. During all this time, Kurisu has been slaving away building some sort of temple. On this fateful day, however, a new girl named Maria has accidentally dropped a rock on one of the overseers' feet. "I'll beat that gutsy nature out of you!" Kurisu steps in and defeats the overseers. Of course this just leads to him getting the crap knocked out of him, but it turns out that Maria was the daughter of one of the soldiers. 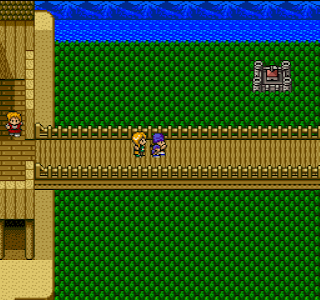 In gratitude he sends you, Maria, and Henry down a river on a barrel to escape. 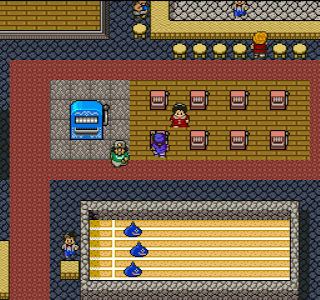 We wash up at a church, where Maria gets cleaned up, but decides to stay at the church. Kurisu and Henry head off to a nearby town, where we can buy a wagon for 3000 gold. This allows us to start recruiting monsters. Monsters will offer to join you after you beat them if they think you're strong enough. I quickly got a slime, brownie, and stinking man. They can level up, learn spells and techniques, and equip things just like anyone else. Unfortunately you can't name them (at least not yet). There's also a casino, but there's no video poker or blackjack! 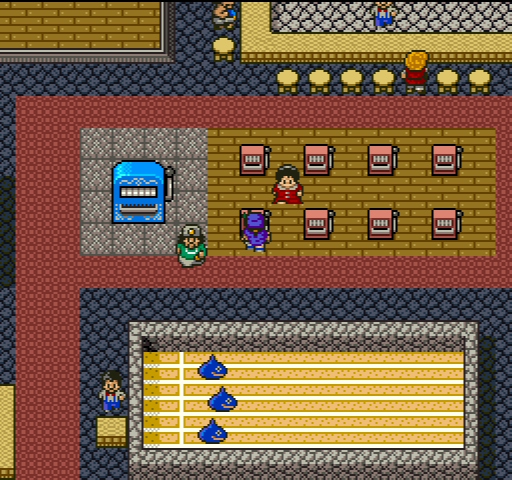 What kind of DQ casino is this? 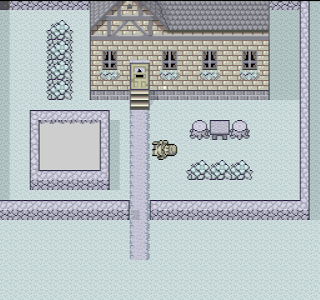 The next town is Papas' hometown again, but it's looking much worse than it did ten years ago. 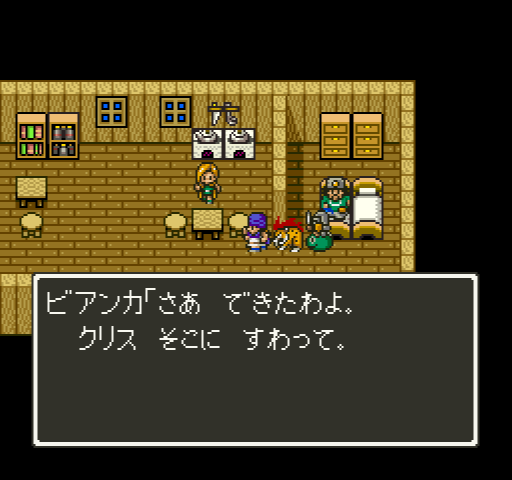 Apparently the soldiers from Reinhart burned and pillaged the town, because Papas was blamed for Henry's disappearance. They're really trying to milk every sad thing they can out of this. 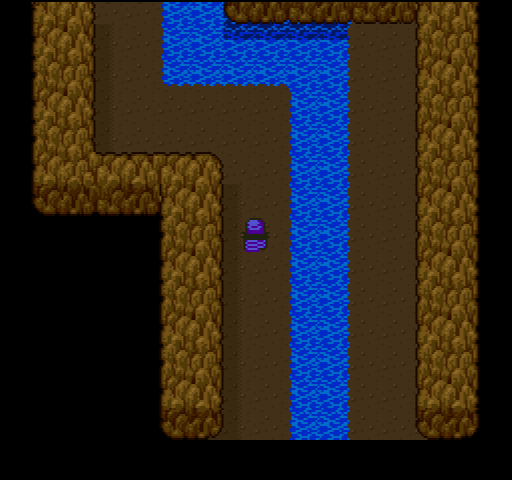 An old man recognizes you and lets you use his boat to explore a new area of this cave (he blocked the door in the young period). If you're not familiar with DQ, Metal Slimes are an iconic enemy. They tend to run away, and your attacks frequently miss or only do 1 damage. But if you can beat one they're worth big XP. 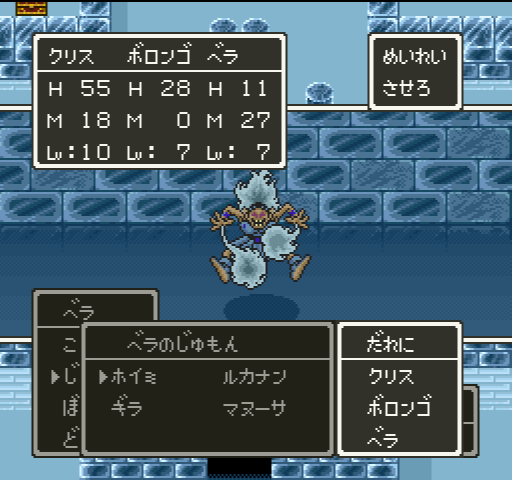 3 and 4 had introduced new types of metal enemies which I assume will show up here too. I don't like grinding so I didn't wander around just to find these, but I did manage to beat a few in this dungeon. Any part of this floor you step over cracks, and the corresponding water square one floor below disappears. I didn't realize what was going on. Anyway, at the bottom of the cave is a sword and a letter from Papas. Papas had begun to search for the legendary hero equipment to try to find the hero himself. Standard RPG trope would suggest Kurisu is the hero, but he can't equip the sword, and based on one small thing I know about this game I don't think that's where the plot is heading. Next up is Alpaca. Unfortunately Bianca is long gone, so it's off to Reinhart castle. Henry's brother Dale has become the king, but things don't seem to be going very well in the kingdom. 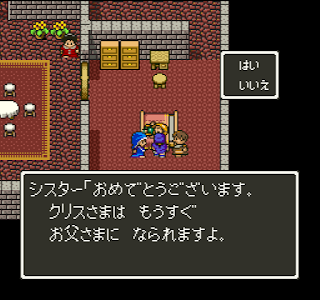 Henry keeps his slave clothes on so he's not recognized, but we still have to use a secret entrance into the palace. On the way we find a woman claiming to be the real queen, but there's nothing we can do about her for now. Instead, Henry secretly reveals himself to Dale, who gives us a key to the castle so we can take a secret warp -- there's a tower with a mirror in it. 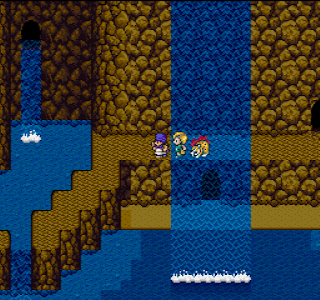 It's not clear how that's going to help, but in RPGs you generally go where the clues lead. Not very hard. Once that's finished, peace is restored to the kingdom. Henry stays behind, leaving our party as Kurisu and two monsters (surprisingly only 3 characters at once allowed in this game). 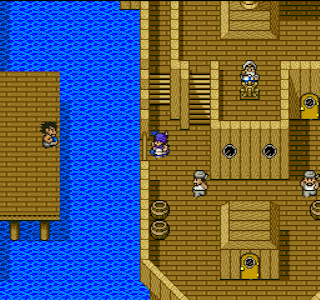 The harbor where we sailed into at the very beginning of the game is now open again and we can sail to the western continent to see if we can find more of the hero equipment. 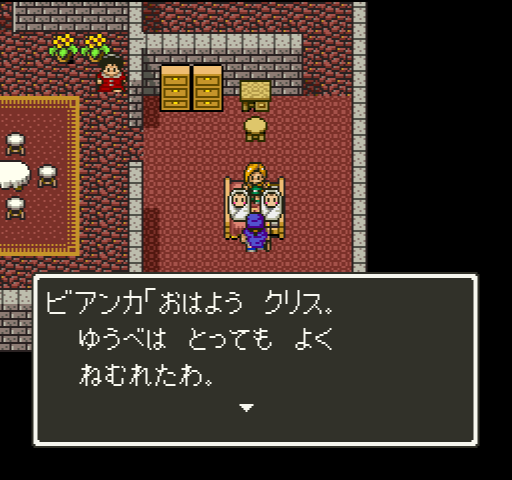 If you return to Reinhart later, Henry has married Maria, and you can buy a world map from the same person you bought the wagon from earlier. Now we sail for the western continent. Soon after arriving, we are approached by a man from a rural town to the south, who offers 3000 gold (1500 upfront) if we can deal with a monster who is ruining their crops at night. 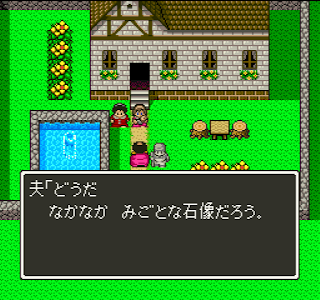 If you wait until night you see a shadowy figure fleeing the town, to the west. There's a cave out there, and at the bottom is a panther. This is of course Bolongo, the baby panther we saved from the kids all those years ago. If you show him Bianca's Ribbon he'll join the party. If you then head back to the town they think you tricked them -- you were in league with the monster the whole time. They pay up the 1500 gold but aren't happy about it. This is surely the best known game on my list so far. Of course the Dragon Quest series is the pioneer RPG series in Japan, and as far as I know it still outsells Final Fantasy there. 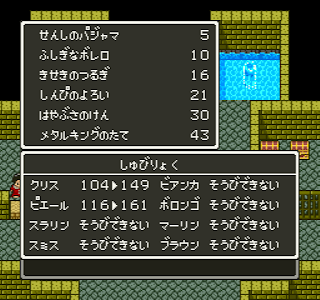 The first four games in the series were all localized into English for the NES. 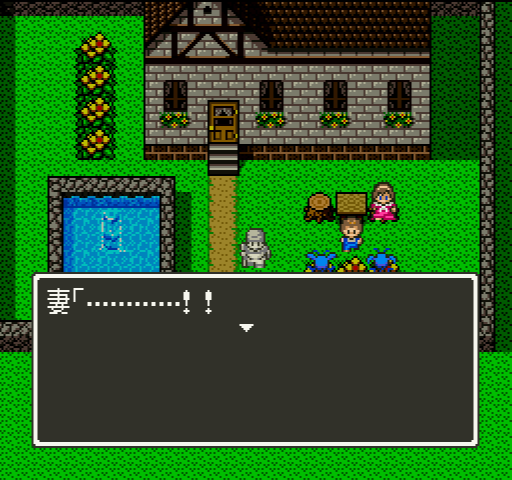 They went all out for the first two, improving the graphics and adding a battery save (the Japanese versions of I and II used passwords instead of save files!) 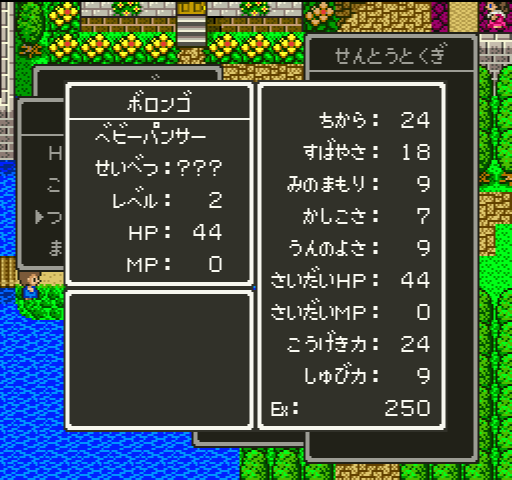 They also changed the names to sound more high fantasy (e.g. 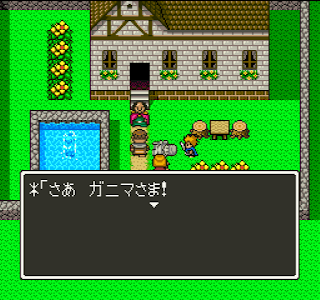 "Loto" to "Erdrick") and translated the dialogue in a pseudo-archaic style, whereas the original Japanese is standard colloquial language. Unfortunately after IV, it was 9 years until the next game came out in English. 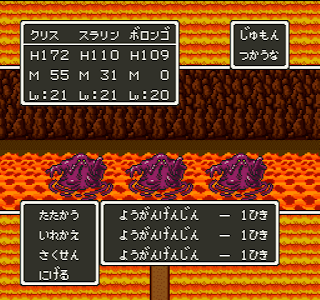 V and VI, the Super Famicom titles, were skipped, along with the remakes of the first three games. 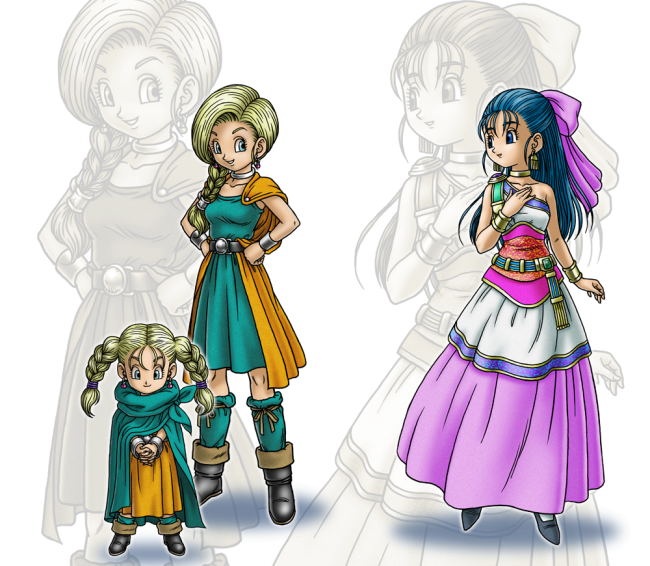 However, complete or nearly complete fan translations of both games were done in the early 2000s, letting Western players experience them. Subsequently the DS remakes of both games were localized. 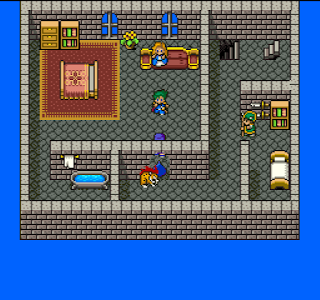 So this game is pretty well known and can be experienced in English both in original and remake form. If the only purpose of this blog was to document unknown games, I would skip this, but I also just want to have fun playing good Super Famicom games. 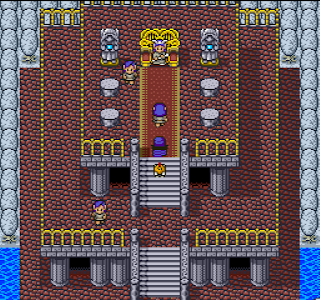 Anyone who has played the first 4 games will feel right at home here; Dragon Quest has always kept a more consistent gameplay style than Final Fantasy. 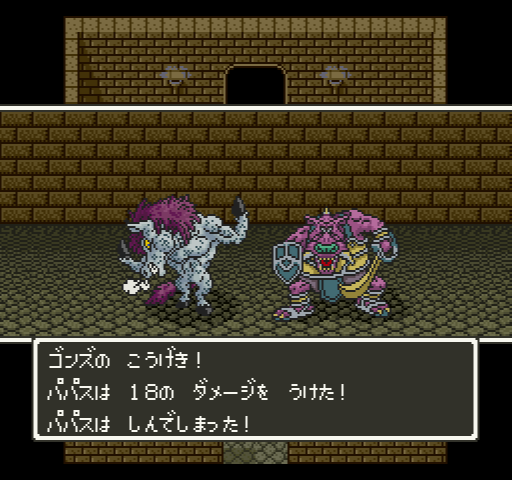 The sound effects are all the classic ones, and Sugiyama's music and Toriyama's character and monster designs are familiar. Of course there are new elements as well. 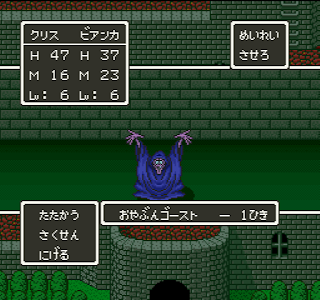 The slime is the iconic enemy of Dragon Quest, so it's almost always among the first monsters you encounter. 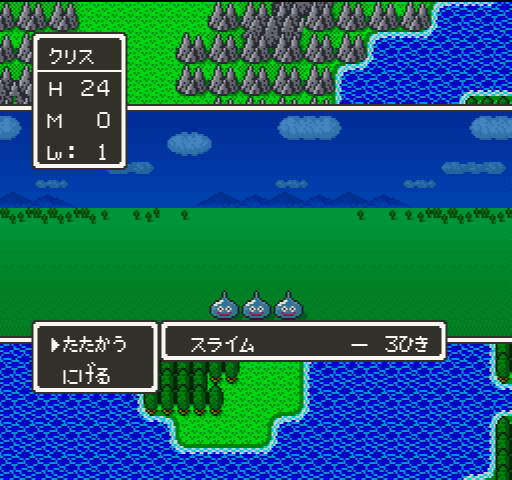 Three slimes is a bit much for 8 year old Kurisu, but Papas quickly comes in to support and make quick work of the enemies. 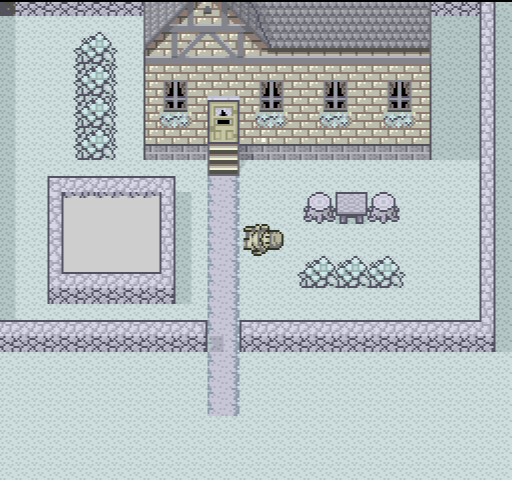 Then we continue on to Papas' hometown. 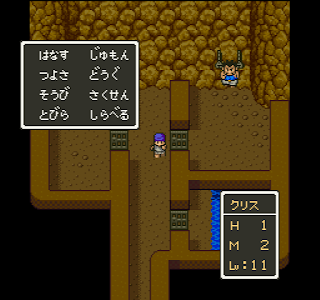 While Papas is engaged with other stuff, Kurisu is able to wander off into the first quest -- finding a medicine maker who has been trapped in a cave in the town. Fortunately the merchants are willing to sell weapons and armor to an 8 year old. 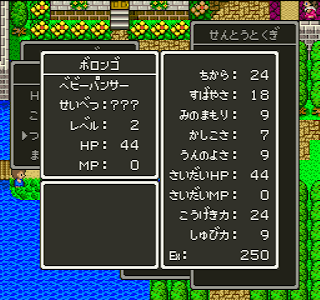 By the way, you can finally see the stats of equipment and who can equip it before you buy it. I think maybe Heracles III had this too, but none of the other games. One thing I've always liked about DQ is how dying takes you back to the last place you saved with half your money, but everything else intact. Coupled with the ability to store money in a bank (or just buy equipment with it), this usually means that you don't have to grind before you can even attempt a dungeon. You can always try your best and then just accept the death, and next time you try you'll be stronger. Once you get the "leave dungeon" and "return to town" spells it's even better. Kurisu saves the medicine guy, with Papas none the wiser. Now it's off to Alpaca to the west, to deliver the medicine. Here Kurisu meets Bianca, the innkeeper's daughter. 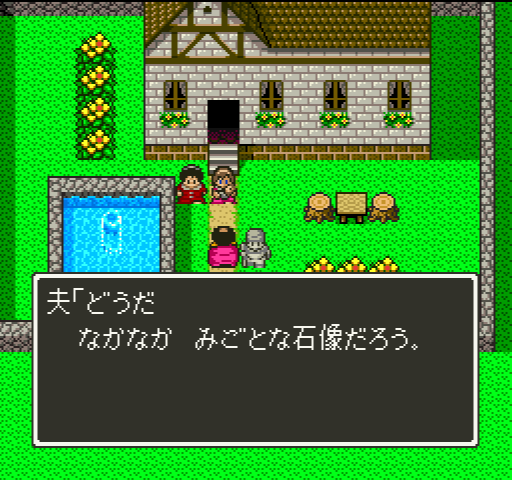 They see some kids tormenting a "cat" of some sort, but they promise to release it if you'll clear the ghosts out of a nearby castle. Of course we have to sneak out at night so our parents don't know. The castle is a little harder than the caves. It has a delightfully creepy atmosphere, with ghosts everywhere, things moving on their own, and such. It even has an inn you can stay in, which transports you back to the beginning by an old man's ghost. I wasn't aware of this at first and walked all the way back to the town. Papas takes ill by the same sickness Bianca's dad had, so that gives you as many nights as you need to finish the castle. The brownies are tough enemies who miss most of the time but get criticals that can take a lot of HP off. I lost to the boss ghost once, but once Bianca learns the lower defense spell it's much easier. 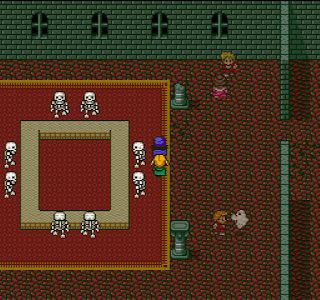 Once you beat the boss ghost, the ghosts of the king and queen can re-enter their graves, thus calming the castle down. The kids then agree to give you the cat, who is actually a baby panther. 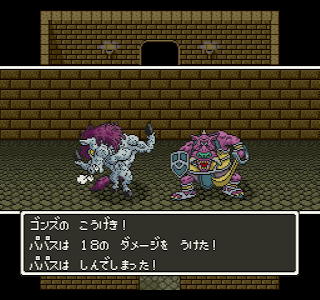 One of the new features of this game is that you can recruit monsters. 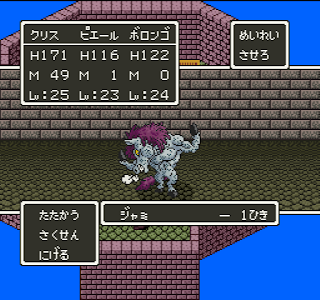 DQ4 had some monsters you could get on your team but they were set by the plot; this game lets monsters join you after battle. Here's some nice fan art of Kurisu, Bianca, and the panther. Papas then recovers and we head back home, leaving Bianca behind. Now it's time for Kurisu's third secret adventure. A wispy elf, who only Kurisu can see, appears and leads Kurisu up some stairs to a secret land of elves. The head elf needs a wind flute to restore spring to the land. Are you sure this isn't just a dream? 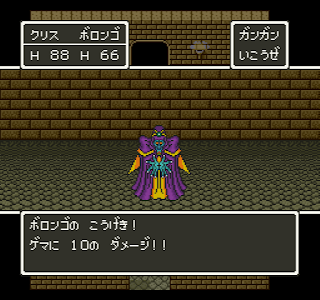 An elf, Bera, joins you as well, although you can't change her equipment. I was finally able to buy the Boomerang for Kurisu. This is a nice weapon that's new to the series with DQ5; it can hit all the enemies. There are also whips that can hit a group. The damage goes down after the first target but they're still pretty good. Slimes, humans, and elves living together. How nice. 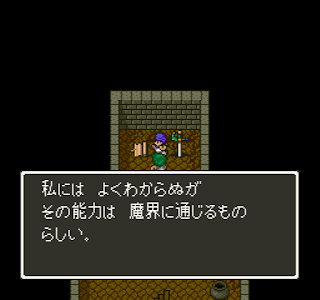 The elf quest involves two parts. First you have to go learn the technique of the thieves' key from a dwarf in a cave. Then once you have that, you can open the door to the ice cave up north. 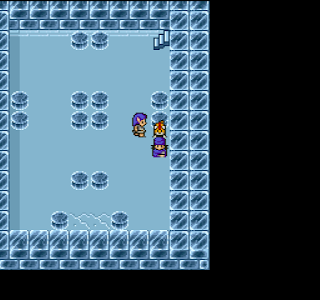 The ice cave is interesting because you have to plan your movements. You go sliding around when you walk a direction so it takes some experimentation to get everywhere and recover all the chests. 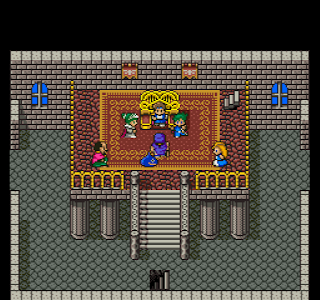 Finally we confront the boy who stole the flute, and it turns out he was being tricked by an evil magician. 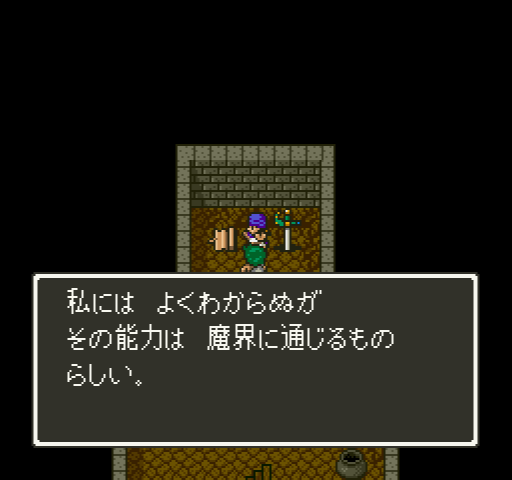 This completes the elf quest, and the elf leader is able to restore spring to the land. He promises that when Kurisu becomes an adult, he'll repay the favor. 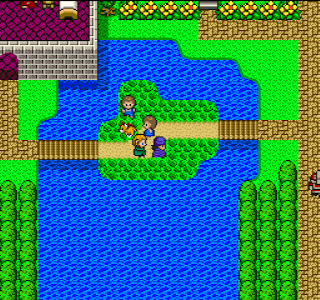 Of course Papas continues not to know anything about his son's adventures, and next we're off to a castle. It seems the new queen favors her own son over her stepson's, who is first in line. Papas is assigned to look after the crown prince, although he's a big jerk. It's not very long before bandits come in on the queen's orders and kidnap Henry (the crown prince). They're supposed to kill him, but they decide to sell him into slavery instead; same result, plus they get money. This time Papas jumps into action, leaving on his own to find Henry, and making you follow behind. 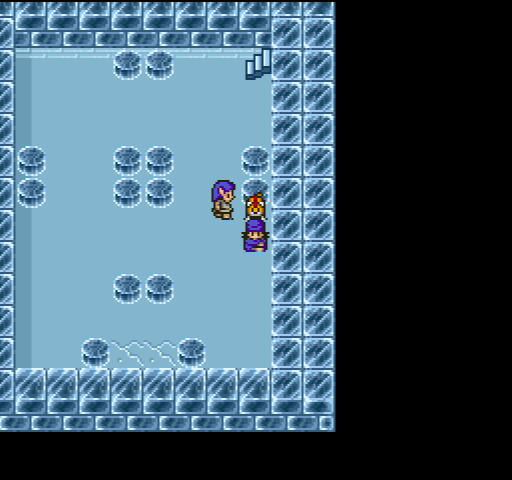 After progressing through a twisty cave, Kurisu catches up with Papas and we find Henry, in the clutches of some sort of warlock or demon named Gema. Gema sends his lackeys after Papas, who fights them off easily. But then Gema grabs Kurisu and holds a knife to his throat, forcing Papas to stand while the lackeys beat him up. "Gonz's attack! Papas takes 18 points of damage! Papas dies!" So Kurisu gets to watch his father beaten up and killed. Gema then attacks, and easily wipes the floor with both Kurisu and the panther. Once Kurisu is knocked out, Gema decides to sell both Henry and Kurisu into slavery, and throw Bolongo out in the wild where he'll revert back to being a normal wild panther. This is the end of the first section of the game, and the story moves ahead 10 years -- Kurisu and Henry are still slaves. That's a remarkably dark turn of the story. 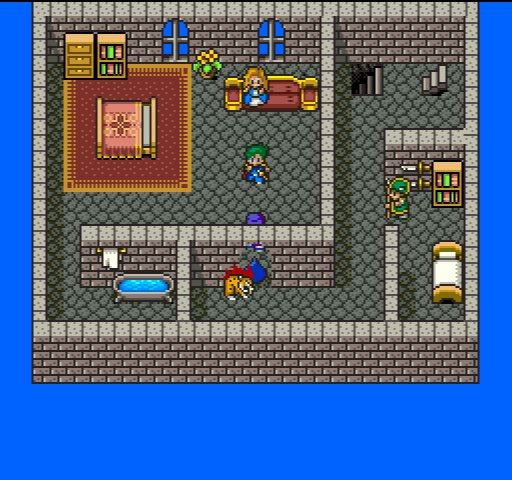 There are a lot of parent deaths in video games but here they actually let you travel around with your dad and do stuff with him, so it's a lot more emotional when he dies, especially since you have to watch the enemies chip him down with attacks, while he just sits there and skips his turns. Not only that, but then Kurisu spends more than half his life as a slave. So that's where I'll end this post. 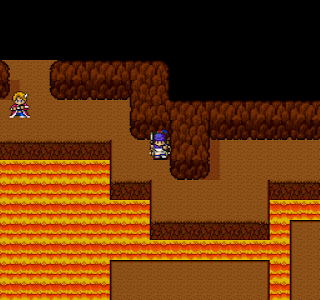 I'm already several dungeons beyond this so I'll have another big post on Saturday. I'm not sure I can adequately communicate how fun this game is compared to the garbage I've played before it. I'm looking forward to playing the game, and I don't have to use any speedup buttons or anything like that.